Apress's latest release Power Plays: Energy Options in the Age of Peak Oil by Robert Rapier reflects on the beliefs among people who are concerned about resource depletion and the debate on peak oil. These beliefs cover a wide span and include those who believe that a peak is imminent, followed by a catastrophic decline. Those who believe peak oil will inevitably lead to cleaner or for that matter, dirtier environments as we become more desperate for energy and turn to more oil sands and coal to replace declining oil supplies. So how has the energy driven expansion over the last 250 years changed the way we live? What kind of risks and tradeoffs has structural dependency on energy usage brought about? Most importantly, is there such a thing as a perfect energy policy? 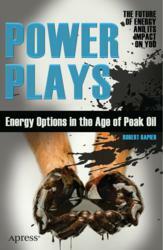 In POWER PLAYS: Energy Options in the Age of Peak Oil (Apress, March 28 2012) Robert Rapier helps readers sort through energy hype, doom and gloom, and misinformation to understand what really matters in energy, and how it impacts individuals, investors, businesspeople, and policy makers worldwide. The book covers the overall global energy situation, the particular risks for the U.S. with its present energy mix, the energy outlook for the developed world and emerging economies like China and India, what peak oil really means, and the present and likely future of natural gas, coal, oil, nuclear power, and alternative energy sources. We must transition away from fossil fuels with a sense of urgency, for reasons discussed in this book. To achieve this transition, we need to develop systems and services with a much lower fossil fuel dependency. Rapier shows how to ensure adequate energy supplies during the transition. During the transition process, we must take care of our air, water, and especially our top soil to preserve our ability to feed the population. Robert Rapier contends that the basis of a sound energy policy should start with an understanding of what those trade-offs may be (namely environmental, economic, and political), followed by evaluating the risks, and then making informed choices on our energy usage. Robert Rapier works in the energy industry and writes and speaks about issues involving energy and the environment. He is Chief Technology Officer and Executive Vice President at Merica International, a forestry and renewable energy company involved in a variety of projects around the world. Robert has 20 years of international engineering experience in the chemicals, oil and gas, and renewable energy industries, and holds several patents related to his work. He has worked in the areas of oil refining, natural gas production, synthetic fuels, ethanol production, butanol production, and various biomass to energy projects. Robert is also the author of the R-Squared Energy Column at Consumer Energy Report, where he serves as Managing Editor. His articles on energy and sustainability have appeared in numerous media outlets, including the Washington Post, Christian Science Monitor and Forbes. Apress Media LLC is a technical and business publisher devoted to meeting the needs of IT professionals, software developers, programmers, and business leaders with more than 1,000 books in print and electronic formats. Apress provides high-quality, no-fluff content that helps serious technology professionals build a comprehensive pathway to career success. For more information about the innovative approach Apress takes to publishing, please visit http://www.apress.com. ROBERT RAPIER IS AVAILABLE FOR INTERVIEWS.